SAINT PAUL, Minn. (July 28, 2010) On the heels of the highly-anticipated release of Wine 1.2, CodeWeavers, Inc. today announced the simultaneous release of CrossOver 9.1 and CrossOver Games 9.1 for both Mac and Linux. Based in Saint Paul, Minn., CodeWeavers is a leading developer of software products that turn Mac OS X and Linux into Windows-compatible operating systems. CrossOver allows Windows software to be used on Mac and Linux PCs without the need for a Windows operating system license. Available immediately, CrossOver 9.1 fully incorporates Wine 1.2, which the Wine community released on July 16th. The Wine Project is an open source technology developed by hundreds of volunteers worldwide. Wine enables millions around the world to run Windows software on Unix-like operating systems, all without needing to run Windows itself. 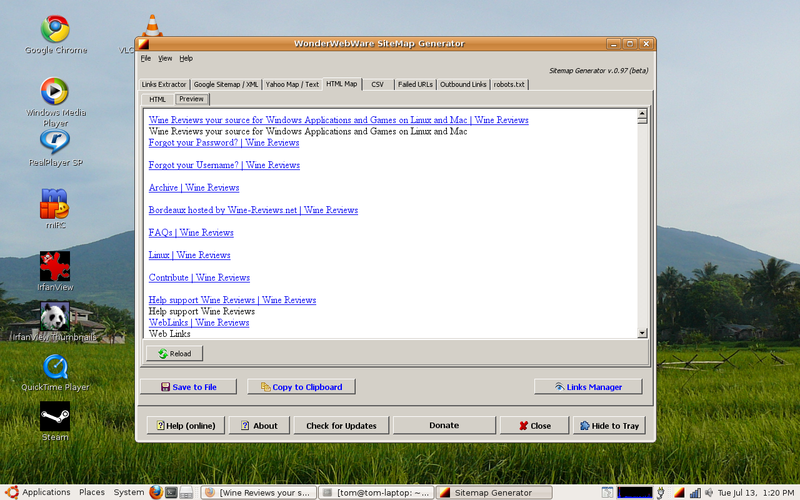 CodeWeavers is one of the founders and largest supporters of The Wine Project and sells CrossOver and other software as supported versions of Wine. "Wine 1.2 version featured the work of 328 people including a lot of hard work from our team making more than 23,000 separate patches over two years," said Jeremy White, CodeWeavers CEO. "CodeWeavers was proud to be a part of that effort, and we are thrilled to be able to bring that work to our customers with this release of CrossOver." CrossOver 9.1 and CrossOver 9.1 Games replaces all previous versions of CrossOver. Last Friday the Wine Project shipped Wine 1.2. This was the work of 328 people in over 23,000 separate patches over a span of two years. CodeWeavers is proud to be a major part of that effort and were thrilled to see Wine reach this milestone. This represents a major step forward for Wine you can see the full list of accomplishments in the announcement. My personal favorite is the spiffy new icons. The CrossOver products already contain most of those changes, as we roll our work on Wine into CrossOver as we go. However, we are hard at work on CrossOver 9.1 and CrossOver Games 9.1, which will contain all of Wine 1.2. By way of celebrating, were making beta versions of CrossOver 9.1 and CrossOver Games 9.1 available to all current customers. If you are a current customer, you can download the beta from your account. Of course, we only recommend the beta for folks that enjoy bleeding edge software. If you don't enjoy the thrill of something right on the edge, you should wait a week or two until we finish putting the polish on the official 9.1 releases. CodeWeavers and Wine-Reviews have put together a special dealcode just for gamers and especially Transgamers. So if your a current or ex Transgaming Cedega customer and you would like to take the leap and switch over to CrossOver Games now is the perfect time to do so. With this special dealcode "ComeToTheLight" you will receive a instant 25% discount off the normal retail price of CrossOver Games or CrossOver Professional. Thats right, this dealcode will drop the price of CrossOver Games down to only $29.96 And Crossover Professional down to only $52.46, CrossOver Professional comes bundled with a full copy of CX Games by the way. Update 01/23/2018 : The ComeToTheLight dealcode has expired, you can now use "UNITY" as your dealcode and save 30% off CrossOver for Mac and Linux. 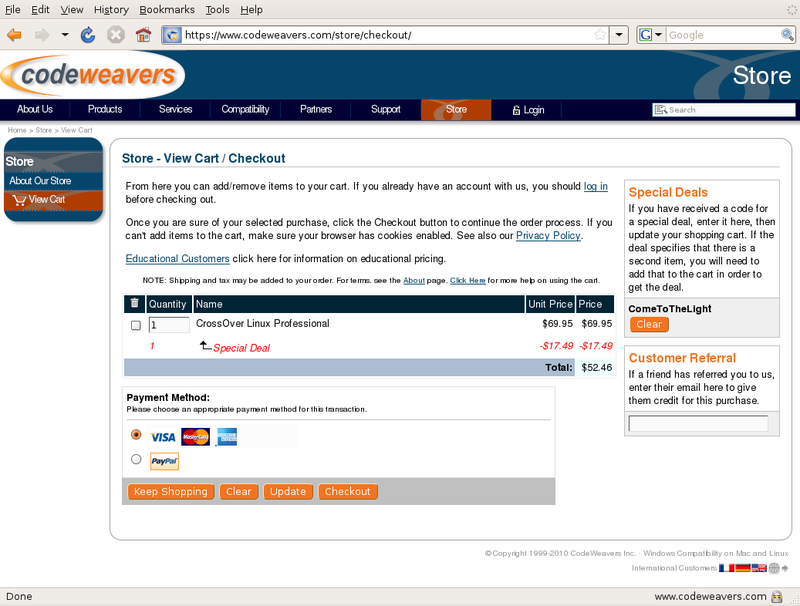 The new and improved CodeWeavers CrossOver version 9 was recently released, So if you need a Windows Application or Games to run on Linux or Mac OS X this is your chance to get it at 25% off the normal selling price. Now gamers can play the games they want, on whatever platform they want! With CrossOver Games, you can run many popular Windows games on your Intel OS X Mac or Linux PC. Whatever your tastes — first-person shooters, fantasy, strategy, MMORPGs — CrossOver Games lets you run many popular game titles. CrossOver comes with an easy to use, single click interface, which makes installing your games simple and fast. Once installed, your game integrates seamlessly with your Desktop. Just click and run! Best of all, you do it all easily and affordability, without needing a Microsoft operating system license. CrossOver Games is capable of running a wide range of Windows games. To see if your favorite game is supported, please check the CrossOver Compatibility Center. Select "Show All Applications" to see a full list of ranked Applications and Games. Keep in mind this sale is for a limited time only, and may be discontinued at any time. So take advantage of this offer while you still can, just apply "UNITY" and save 30% and then start playing your favorite games on Linux or Mac OS X. So why not "ComeToTheLight" and save 30% off CXGames and CXOffice. Google SketchUp is one of my favorite applications. Its a free 3D software that I use to create my fabulous 3D models. It works well and lets my imagination and fingers do their magic. Its an excellent therapy for mind and soul. Theres only one problem, so to speak. It has been designed to work on Windows and Mac only, with no Linux version in the offing. All in all, its not a tragedy, since I believe in using any software and/or operating system that meets the requirements. If you need to draw a bit, you power Windows and do what needs to be done. But some people may not have the privilege to make the cross-platform choice. For them, Google SketchUp is on the wish-list. Or is it? Well, it turns out you can have Google SketchUp in Linux. It requires Wine. Overall, the installation is very simple and you will get a decent experience. It wont be a perfect one, mind you, but its a great beginning. There's hope. I have shown you not long ago how to use winetricks to easily obtain missing programs and libraries required by some of the Windows programs installed using Wine. Winetricks is a very smart wrapper script that will facilitate the installation of extra components, letting you focus on getting your desired application to run. Now, to get Google SketchUp to run, you will need some fonts and Visual Basic libraries. Run Google SketchUp - Have fun! Now, time to power up the program and enjoy! And here we go, a spectacular gallery of Google SketchUp on Linux, with a handful of my breathtaking models posing for you, including some that have yet to be unveiled sometime in the future. You're having an exclusive preview of an artist's work even before it's finished, a sin in some places. Some of the models were designed in the older version of the program (v5 beta), but there were no problems opening and playing with them. Well since Nullsoft does not provide any support for other then Microsoft Windows OS it could be tricky somehow to get it running on another OS like Mac OS X or even another *nix system…but it is not impossible. The thing you need is Wine to get it running on your *nix system or if you own a Mac like me you can use your copy of Crossover as well. I must say the last option will work the best if you want to use this kind of app…. This time we are going to use Crossover Mac 9.0.1 Standard/Professional in order to run Winamp 5.57 on Mac OS 10.6.4. In advance I must say that this version of Crossover does not support Winamp by default and neither does any previous versions of it. But you might ask…is it possible anyway…? I must say yes…! To my surprise the installation went smooth without any bugs and after the installation the program does work very well or at least for everyday use. Although I have came into the problem when you drag the window around it may feel kinda laggy when doing so. But otherwise it works well for most of your tasks with Winamp. As you can see from the picture above it even runs with the new theme style in Winamp but for better compatibility I suggest to use the old Winamp skin for faster response and use of the program. 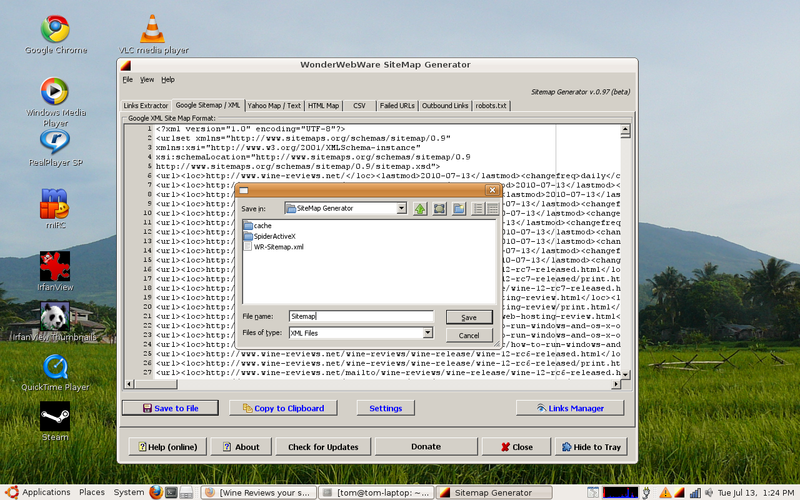 To setup your Bottle in Crossover you only need to use a WinXP environment and continue with the installation. Winamp does not need any other runtime components to run and after installation you can use it like you did on your Windows PC.